Bilbao is the capital of Vizcaya in the Basque Country, Spain. The city is situated on the banks of the Nervión, a tidal river. 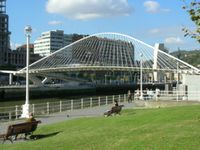 The climate in Bilbao is milder than in most other parts of the peninsula, rarely falling below freezing in winter, or rising above 35ºC in summer. There is also more rain, which is a mixed blessing. The green hills of Bilbao are a welcome relief after an extended stay in the dry plains in the south, but planning a day at the beach is more risky. The population of Bilbao proper is just over 372,000, but within the metropolitan area there are over 1,000,000 inhabitants. Bilbao is divided into eight district areas: Deusto, Uribarri, Otxarkoaga/Txurdinaga, Begoña, Ibaiondo, Abando, Rekalde and Basurto/Zorroza. To get in from San Sebastián, the PESA and ALSA buses take off from the main bus station. In Google maps you can type in 'Estación de Autobuses de San Sebastián, San Sebastian, Espana' to see where it is. You also need to buy a ticket from the PESA or ALSA ticket office before you board as you can't buy tickets walking onto the bus. The company linking Bilbao to Santander is ALSA (tel: +34 902422242), and in theory you can get info about buses from Santander to Bilbao at . Be prepared for long waiting lines of half an hour as there are only two ticket offices. It's usually better to buy the ticket the day before or print your ticket on the company's website. Instead of printing, you can also use the text message they send to your mobile as proof of purchase. Bilbao Airport (IATA: BIO) is served by Lufthansa, Air France, Air Berlin, TuiFly, AerLingus, Iberia, Air Europa, Vueling, Norwegian and several other airlines. Easy Jet flies from London Stansted and Manchester to Bilbao airport. You can also fly with Ryanair to Santander. To get to downtown from the airport, take Bizkaibus A3247 from outside the arrivals hall. From Bilbao, they leave every 30 minutes from 05:25 to 21:55; from the airport, every 30 minutes, from 06:15 to 23:15 (last departure at 0:00). The trip takes about 25 minutes. The bus makes three stops on the way: at Gran Via 79 Viajes Ecuador, Plaza Moyua and Almeda Recalde 11. A single ticket costs €3.00. Biarritz Airport (IATA: BIQ) Is about an hour and half drive to the east of the city and is a popular airport for visitors from France. There are buses between Biarritz and San Sebastian and train that involve at least one change. Once in San Sebastian you can take a PESA bus to Bilbao. For more convenient travel use Airport Transfers for private transfers from Bilbao to any where you want to go. RENFE-- runs intercity trains to Madrid, Barcelona, Vigo (Galicia). All Renfe trains leave from Abando Station. EuskoTren -- runs a local service to San Sebastian, with connection there for Irun (on the Spanish-French border). It takes two hours to reach San Sebastian. Trains leave from Atxuri Station. Bilbao is difficult to drive in. Hilly one-way streets, and frequent construction projects, make it a nightmare for drivers in parts of the city. Having an automobile map helps a lot; without it allow at least 30min extra to find the right exit from the city. A good idea is to park at the Termibus car park (A-8 Exit 117) and take the tram from San Mamés station to where you want to go. If you are going to take more than one or two journeys on public transit, a Barik card would be a good investment. It can save you up to 50% over buying single tickets. 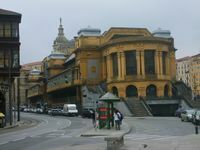 It is valid on all the municipal transit systems in Bilbao (underground "Metro", short distance trains "cercanias", local bus "Bilbobus", province bus "Bizkaibus", Funicular to Artxanda and others, including the Bizkaia bridge). It is a stored-value contactless card available at all Metro stations, it cost 3€ and can be recharged at metro stations, usually in amounts of 5€ . Individual tickets cost from €1.20 upward. MetroBilbao  Convenient, Norman Foster designed Metro. Single line within Bilbao, splitting into two lines after San Inazio station. Line one runs from Etxebarri to Plentzia; line two from Etxebarri to Santurtzi. Trains run every couple of minutes at peak hours. Tickets cost from €1.40-1.60, depending on how many zones your journey covers, or a daily card is available for €4. EuskoTran  A green tram from Atxuri Station to Basurto. The single line runs along the river passing the Bilbao Guggenheim Museum. Single tickets cost €1.15, and are sold from machines at tram stops. Don't forget to validate the ticket before boarding. EuskoTren  Local train service leaving from Atxuri Station for Bermeo, Guernica/Gernika and San Sebastian (Donostia). Some good views but the train is slower than buses. Artxanda Funicular Spectacular views of Bilbao. La Ría Maritime Museum, Muelle Ramón de la Sota, 1. Located in what used to be the Euskalduna shipyard, next to the current Euskalduna Performing Arts Center. The Museum covers an area of 27,000 square metres, 7,000 for indoor exhibitions and 20,000 for outdoor exhibitions, the three docks, the walkway surrounding them and the estuary. Adults: €5; Students, people over 65: €3.50. Children under 6: free of charge. Winter: Tue-Fri, 10AM-2PM, 4-6PM. Sat-Sun, 10AM-2PM, 4-8PM. Summer: call to check. Museo Taurino (Bullfighting Museum), Martín Agüero, 1, Plaza de Toros de Vista Alegre, (Near Plaza Zabalburu), tel. 94-444-8698. Next to a bullring, the Museo Taurino highlights the role bullfighting has played in Euskadi. €3. Museo Diocesano de Arte Sacro (Museum of Sacred Art), Plaza de la Encarnación, 9-B, Atxuri, tel. 94-432-0125. A former convent founded in 1515 by Dominican nuns. General: €2. Students, seniors, and under 18: €1. Free on Thursdays. Museo de Reproducciones Artísticas (Museum of Artistic Reproductions), Conde Mirasol (no number), tel. 94-415-7673. Full-scale reproductions of the world's most famous works of art. Call ahead for a guided visit. Cathedral of St. James (Santiago) Gothic Style 14th century Cathedral, named after Bilbao's official patron saint. Three naves and small Gothic cloisters. The building was designated a cathedral in 1949. Its Neogothic tower and main façade were designed by Severino de Achúcarro in the 1800s. The adjoining square (Plaza de Santiago) bosts a fountain designed by Luis Paret during the reign of Carlos III with the inscription Por el bien público (For the good of the people). Iglesia de San Antón Gothic style church from the first half of the 15th century (1422). Dedicated to San Anton in the 16th century, the building is a mixture of styles including a renaissance portico and baroque tower which was built in 1777. The church was constructed on the ruins of a former alcazar, and is shown on Bilbao's shield. Basílica de Begoña, . Overlooking Bilbao, this is perhaps the most symbolic religious building in the city. Built in the 16th Century by Sancho Martinez de Arego, who was also responsible for the Iglesia San Anton. It is a basilica of three naves. During the first Carlista War, in 1835, the façade and the tower were destroyed. The present ones were designed Jose Maria Basterra and constructed between 1902 and 1907. Iglesia de San Nicolás, Esperanza, 1 (Arenal, Casco Viejo), 94 416 1424. The Iglesia de San Nicolás, finished in the 19th century, is dedicated to the patron saint of sailors. One of the best examples of Baroque architecture in Vizcaya. Iglesia de San Vicente Martir, Plaza de San Vicente, (Near: Abando), 94-423-1296. Gothic church built in the 16th century. Alhóndiga  an amazing building which has recently be modernized and is now called Centro Azkuna / Azkuna Zentroa. It is a complex containing a library, several bars and restaurants, a cinema and even a roof swimming pool with a glass floor! A must visit! Birthplace of Miguel de Unamuno, c/La Ronda 16, next to Plaza Unamuno (Metro station: Casco Viejo). Spanish author born on the 29th of September 1864. His works include the novels Niebla and San Manuel Bueno, Mártir, which are both read in AP Spanish Literature classes in the United States. Unamuno died on the 31st of December 1936 in Salamanca. Teatro Arriaga, tel. 94-435-5100, . Originally inaugurated on the 31st of May 1890, on the site of several former theaters, the first Teatro Arriaga burnt down on the 22nd of December 1914. The second Teatro Arriaga opened on the 5th of June 1919 with an ornate façade and beautiful interior. 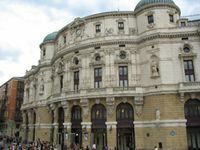 The theater, and the square in front of it, were named after Juan Crisóstomo de Arriaga, a composer from Bilbao. There is a tourist information office in the building: the entrance is on the left side as you face the theater. Estación de Santander (Santander Station, FEVE Station) also known as La Concordia, was built between 1898-1902 on the banks of the Nervión. Designed by the engineer Valentín Gorbeña, with the art nouveau main façade added later with a design by the architect Severino Achúcarro. Estación Abando (RENFE station) is right next to Santander Station. Even if you are not going to take a train, visit the platforms, there is an impressive stained glass atrium depicting some traditional Basque jobs. Puente de San Antón Next to the Iglesia de San Antón sits Bilbao's most emblematic bridge. Mercado de la Ribera Another emblem next to the Iglesia de San Antón is the Mercado de la Rivera. One of the biggest covered markets in Europe. It was built in 1929 on the site of the original Rivera Street market. Produce fish and meat are sold in the market every morning, except Sundays. Plaza Nueva Bilbao's Plaza Nueva was originally named Plaza de Fernando VII. Construction began on the plaza on December 31, 1829 and finished exactly 20 years later on December 31, 1849. This plaza was the seat of the Diputación de Vizcaya until July 1900 when the Diputación moved to its new home on the Gran Vía. 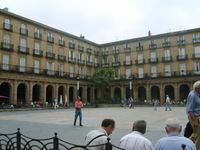 The Academy of the Basque Language (Euskaltzaindia) currently occupies the old Diputación building in the Plaza Nueva. There is a market of used books, stamps, coins, and other small items in the plaza every Sunday morning. The Plaza Nueva is surrounded by buildings and only has entrances on some sides. Palacio de la Diputación Ornately decorated palace situated on the Grand Vía. Baroque-style monument designed by Luis Aladrén in 1897 to serve as the seat of the Diputación Foral de Bizkaia (Vizcaya) and inaugurated on July 31, 1900. The interior is just as lavish as the exterior, with beautiful stained glass windows. Plaza Moyua and Gran Vía On the strech of the Gran Vía between Plaza Abando and Plaza Moyua is the main shopping and fashion district of Bilbao. On this short stretch you can find tons of clothes shops (For, Zara, Mango, H&M) as well as department store El Corte Ingles. This is a must-walk street. Parque Etxebarria The site of a former steel factory, this park was created in the 1980s as the first step of reorienting Bilbao from the industrial sector to the service sector. Wonderful views of the Casco Viejo and the Teatro Arriaga. There is a prominent chimney in the park, left over from the site's time as a factory. The park hosts a fun fair in August. Ayuntamiento (City Hall) (also known as la Casa Consistorial or Udaletxea) Plaza Ernesto Erkoreka, 94-420-4200. The city hall opened in 1892. Designed by architect Jaquin Rucoba in neo-baroque style. Don't miss the main reception area, called Arab Salon. Zubizuri The graceful white footbridge designed by Santiago Calatrava. It spans the Nervión connecting the riverwalks Campo Volatin and Mazarredo. Be careful, the bridge is slippery when wet! El Tigre Tiger statue on top of a building in Deusto. Seen from Euskalduna Performance Center. Bilbao Airport Curvaceous white 'bird-like' building by Santiago Calatrava. Strangely missing an arrival hall. Biblioteca Municipal de Bidebarrieta, Bidebarrieta, 4, (Casco Viejo, near Teatro Arriaga), tel. 94-415-6930. Commissioned by El Sitio society at the end of the 19th century, this building was built by architect Severino de Achucarro as a social hall. Now home to the city's historical archives and library. Palacio de Ibaigane, Alameda Mazarredo, 23, tel. 94-424-0877. Home to the Athletic Club de Bilbao, Bilbao's football team. Built in the early 20th century. Note the arched entranceway. The nearest metro stop is Moyúa. Palacio de Olábarri, Campo Volantín, 37, Palacete del Puerto Autónomo de Bilbao, tel. 94-487-1200. An interesting mix of several architectural styles. In the late 19th century it was the residence of Bilbaino entrepreneur José María de Olábarri. Now the seat of Bilbao's port authority. Santa y Real Casa de la Misericordia, Sabino Arana, 2, tel. 94-441-1900. Next to Plaza del Sagrado Corazón. Constructed in the mid-19th century as a charitable house for the poor. Beginning the first Saturday after August 15th and lasting for 9 days is Aste Nagusia / Semana Grande, the city's fiesta (holiday). An interesting time to come, but be prepared for lots of noise, music, street theater and events, with firework displays in the evening. Details from the tourist office in Teatro Arriaga. Walk through the seven streets of the Casco Viejo. International Charter Group: . Yacht charter and sailing, one of the worlds largest yacht charter companies, can take care of all charter requirements, from bareboat to crewed in Bilbao. Operating from nine offices worldwide (USA, Spain, UK, Germany, Italy, France, Spain, Switzerland, Caribbean, Honk Kong and Dubai). Gran Vía 22, ☎ 94 435 6300, . 10AM-8:30PM. c/Víctor 5 (Casco Viejo), ☎ 944794340, . 10AM-8:30PM. Fri and Sat night are most popular time for eating pintxos--as it is for going to bars. Aritz. Calle Zugastinobia 4 48012 Bilbao. Was once one of the best Pintxos bars in Bilbao, quite out of the way (almost hidden really in a very small, one way street away from the main thoroughfares). Ask for it and you will be given directions. It is worth the walk since they have won the local Pintxo contests for ages. Closed as of Feb. 2008 and as the summer of 2008 reopened with what appears to be new management with less emphasis on its prize-winning pintxos. It's worth going to this street though because there are dozens other pintxos bars. Tap water is safe to drink, also from the outdoor taps. On weekend nights a lot of people gather in the bar area in eastern Casco Viejo, get their drinks from any of the bars and hang around on the streets before heading to nightclubs. Cafe Nervión wonderful views of the river: c/La Naja 7. Cafe Iruña, c/ Colon de Larreategui 13. With its Arabesque motifs and antique moldings it is a sight to behold. If you go at night, you can also get some nice shiska-bobs - some of the only ones you'll find in Bilbao. Cafe La Granja in Plaza Circular, across from the BBVA tower. Cafe Boulevard on the Arenal, across from Teatro Arriaga. Bar Juantxu. c/ Licenciado Poza, 39. Galeon Alda. Mazarredo, 25, 94-423-1462 Maritime motif a mermaid statue at the entrance and decoration resembling the inside of a ship. Gran Casino Nervión c/ Navarra, 1 tel. 94-424-0007 Two bars, on-site restaurant. Formal/semi-formal dress required. La Mutua c/Ercilla, 2 tel. 94-423-1154 Serving breakfast during the day, and reopening at 11:30PM for the night. Wineberia, Focused in helping people to discover Bilbao through its wine and food culture. They have native guides that lead small groups into a walking tour with stops on traditional food spots to learn and taste the local gastronomy and wine(more details). Holiday Inn Express Bilbao . Zarandoa Kalea 5, Tel. +34.944.868240. Brand new contemporary hotel located close to Bilbao Airport and only 10km from the city centre. Abba Hoteles . This is a chain of 4* hotels, and here you can find a quite rare 3* Abba hotel. It's quite near the Bus Terminal, very near to the metro and quite near to the Guggenheim museum, at calle Rodriguez Arias 66, 48013 Bilbao (Tel: +34 94 441 3100, Fax: +34 94 442 2197). Expensive breakfast. Crime rates can, however, vary significantly between rural and urban areas, though urban areas are still not particularly dangerous. Avoid the San Francisco area. The San Francisco area is however a vibrant area with lots of cheap bars and cheap food run by very nice Bolivian families, as always common sense must prevail when walking around at night. However. Violent crime is extremely rare, but the usual precautions will keep you out of trouble. It is advisable not to wear any Spanish symbols. Spain national football (soccer) tops, Spanish flags or Real Madrid and Atletico Madrid club paraphernalia are best avoided. Alhough no assaults on people wearing them have been recorded, some people might be upset about them. It is also best to avoid referring to the Basque Country as Spain. Take into account that inhabitants of the Basque Country are divided between those who support independence or autonomy from Spain and consider themselves primarily or entirely Basque (the majority, at 51%) and others who consider themselves primarily or entirely Spanish (a 49% minority). Within these currents, there are further subdivisions of opinion ranging from supporters of the Terrorist Group ETA at one end to those who supported the fascist regime of General Franco at the other (though most people fall somewhere in between these extremes). These political issues have dominated life in the Basque Country for generations and you will still find coverage of them in news media across the Basque Country every day. Also certain bars will have a distinctly Basque nationalist clientele (such bars will generally have posters and slogans on the walls) where pro-Spanish opinions will be unwelcome. If speaking to strangers, bear these divisions in mind and try not to cause offence. Be careful with a guy who rides a bicycle and approaches people (mainly tourists) to offer stickers, bookmarks, poems, etc., then asks for money. He speaks English and it's enough to say "no" strongly: he will back off. Guernica - Gernika -- Basque stronghold town, bombed by the Nazis during the Spanish Civil War. Inspired Guernica by Picasso in the Museo Reina Sofia in Madrid. Sopelana Town near the beach. Plentzia Another town near the beach. San Juan de Gaztelugatxe -- Small chapel situated on a breathtaking island between Bilbao and Bermeo. Vitoria-Gasteiz -- Surprising Basque capital awarded with European Green Capital 2012 with a lot of gardens and parks to see and a wonderful historical center with Rennaissance houses, Medieval walls and towers and ¡two! cathedrals. This page was last edited on 31 October 2018, at 12:20.